Heer ye, heer ye! This is the moment that I've been waiting for. After months of planning and anticipation, I was finally at the main entrance of a park that many have raved about. There I was in the town of Rust in Germany, in front of a park that is often compared to Six Flags and Cedar Fair parks. With 13 roller coasters - the most of any European theme parks - and a total of more than 100 different attractions, this is the ultimate theme park destination for many Europeans. Ladies and gentlemen, I present to you... the one and only Europa Park! GO GO GO!!! Scream all you want! Europa Park is the largest theme park in Germany with an area of approximately 95 hectares (around 235 acres). Located in the city of Rust, Germany, the theme park is strategically located in the middle of what I like to call the "Europa Triangle," consisting of the cities of Freiburg (Germany), Strasbourg (France), and Basel (Switzerland). In 2016, Europa Park received 5.5 million guests, making it the second most visited theme park in Europe (after Disneyland Paris' ~10 million) and 21st most visited theme park worldwide. The entrance plaza of Europa Park welcoming guests for a wildly thrilling day ahead. While the park was crowded throughout the day, the park did an excellent job in managing the crowd, especially with regards to the queue and the waiting time. If there is one thing that I am amazed of, it would be how efficient the staffs are at this park. It's amazing! Nearly every coaster is dispatched at 30-45 seconds mark, which - for a high thrill roller coaster - is an amazing feat! Europa Park's landscaping - as shown by how neat the flowers are arranged - is one of the park's highlights. In one aspect, Europa Park also surprised me with its landscaping. Despite many calling the park similar to those of Six Flags and Cedar Fair, I personally think that Europa Park resembles Busch Gardens Williamsburg (Williamsburg, VA) more. Basically, Europa Park is a theme park with Six Flags // Cedar Fair attractions and Busch Gardens theming and landscaping. To maximize your time at Europa Park, the thumb rule is to hit the most popular rides first thing in the morning and then work your way down the "popularity list" of the park. Nevertheless, this is not always the case every time. As such, my recommendation is to first enjoy the rides that are popular AND have low capacity, then work your way down. Consider both components when choosing which rides to experience first thing. I recommend hitting Silver Star, Blue Fire, and Wodan: Timbur Coaster first thing in the morning, as these roller coasters tend to have lengthy waiting time, no matter what. Follow these up with lower capacity rides such as Pegasus, Alpenexpress, Matterhorn Blitz, and Schweizer Bobbahn. Then, you can enjoy minimal wait time for Euro-mir, Eurosat, Arthur: The Ride, Atlantica Supersplash, and Poseidon. Remember that water coasters are always popular on sunny days, no matter what. Europa Park is a theme park themed to, well, Europe. The entire park is divided into zones with respect to participating countries within the region: Ireland, Germany, Austria, Iceland, England, Greece, Scandinavia, England, amongst others. Additionally, the park has zones themed as Adventureland, Grimm's Enchanted Forest, and Minimoys Kingdom. At 95 hectares, the park is massive. With the park shaped more rectangular-like rather than circular, getting from one furthest point to another is quite of a hassle. It took me approximately 25 minutes to walk from the main entrance to the back point of the park, Iceland, which possesses two of the park's star roller coasters. But let's get to that in a bit. Europa Park is a massive park. Make sure you don't get lost! Despite the inconvenient park layout, the landscaping of the park is top-notch. For a park this scale, it surprised me that they actually took the time to theme not only the physical structures in the theme park, but also how they blend in with the surrounding nature. This is particularly stressed in Minimoys Kingdom area, where the main attraction blends very well with the surrounding trees, creek, and the show building. With more than 100 attractions, one might automatically think that Europa Park is an extremely crowded and compact theme park. Surprisingly, Europa Park has plenty of open spaces for the visitors to breathe in. There are plenty of spots where guests can sit down and relax, have a chat, sightseeing, taste food, try drinks, and many more. Going to Europa Park doesn't feel like going a theme park: it feels more like a recreational day at a safe and efficient public garden. The theming at Europa Park is top-notch. Some parts even feel like a real small town rather than a theme park. Theme park goers who frequent Cedar Fair and Six Flags parks might be annoyed by how inefficient some of the park staffs are. Videos like this and this reflect the experience that is often encountered by many park guests. This was not the case when I visited Europa Park. Despite me visiting on a Saturday, the crowd was managed very effectively thanks to the combination of well-behaved guests and well-trained park staffs. Guests most of the time organized themselves accordingly to the number of seats per row without supervision of the staffs, while the staffs conducted excellent dispatches throughout the day, rarely exceeding the 45-second mark (yes, even for rides with high capacity per train). Europa Park guests are well-behaved and orderly, organizing themselves accordingly without staff supervision. It also helped a lot that guests boarded and got off the ride vehicles as quickly as they can, adding even more to the already excellent park operations efficiency. This, in my opinion, is the best dream a theme park goer can dream of: a theme park with excellent operational efficiency, which allows you to experience more of the park in a single day. As much as I want to go on and on about the park's efficiency, I think that's it for now! Let's go to the attractions themselves. Okay, let's go to Norway on this boat! Europa Park is arguably the roller coaster capital of Europe. What's interesting, though, is that most rides at Europa Park are designed and manufactured by Mack Rides, a German-based ride manufacturers that is not as big as, say, Bolliger & Mabillard (B&M) and Intamin, yet has quietly become one of the world's leading ride manufacturers because of the smoothness and reliability of their rides. Theme park fans, however, should not be surprised by this. After all, Europa Park was founded by the same owners of Mack Rides, the aforementioned manufacturer. Rather than a theme park, Europa Park was born as an exhibition site for the manufacturer's products. Imagine the owners be like, "Hey, we have a new product. Wanna test it? Come to our park and see if you like it." How awesome is that? Wodan's first drop as seen from the queue line. But this doesn't mean Europa Park exclusively builds Mack Rides attractions. In fact, some of the more popular rides are not built in-house. B&M and Great Coasters International (GCI) also show some teeth in the park with rather superior products. B&M, for example, showcases its ability to create an exciting roller coaster with Silver Star, which to this day remains one of Europe's most renowned and best roller coasters. Themed to a Mercedes-Benz race car experience, Silver Star takes guests to a top height of ~240 feet before smashing them down back to the ground at a top speed of 79 mph. The layout is a typical out-and-back, and the major drops along the track are quite fun to experience. At 5,315 feet long, Silver Star is a worthwhile coaster that must be ridden. Vroom, vroom, let's go on Silver Star! Silver Star racing through the front side of Europa Park. Nevertheless, I feel that Silver Star is not B&M's best. Having been operating for 15 years, it's no wonder that Silver Star is now dwarfed by B&M's other coasters, for example Leviathan and Fury 325, which at this point remains my 3rd favorite roller coaster I've ever been on (click here for the complete list and here for my complete review). Still, Europa Park has to thank Silver Star for putting the park as one of the most popular theme parks worldwide back then. 8/10. Arguably the park's most beloved roller coaster, Blue Fire is Mack Rides' first entry into their launched coaster model. Those who have been on Blue Fire often praise the roller coaster for being extremely smooth while still maintaining the thrill factor with ample amount of airtime, great inversion, and very comfortable restraints. In case you're wondering, Blue Fire utilizes lap restraints rather than shoulder ones, which give the guests more vulnerable feeling while riding. Blue Fire in all of its glory: the signature curved top-hat and the huge first vertical loop. Blue Fire in the sun. One thing that I like about this roller coaster so much is how Mack Rides placed its elements carefully one after another. The 0-62 mph launch in the beginning, the curved top-hat, followed by a huge circular vertical loop and the airtime hills afterwards, Blue Fire's pacing is one of the best of any coasters I've ever been on. Every element is complemented by the following one, and so on. Yet, despite this, I still don't think that Blue Fire is not a perfect coaster for me. For example, the launch at the beginning is not as intense as I wished for. Still, it is still one of my favorite coasters in the park. 8.5/10. Located right next to Blue Fire is the only wooden roller coaster in the park, Wodan. Similar to other GCI's models, Wodan is particularly known for its speed that is maintained throughout the entire ride. The track spans a length of ~3,500 feet, which is a respectable number considering the compact space that the park had available when constructing the new roller coaster. Combined with a height of 130 feet and a top speed of 62 mph, Wodan is one of Europe's most renowned wooden coasters. Wodan is renowned for its interaction with surrounding areas. Wodan intertwines and interacts with Blue Fire. The real highlight of Wodan, however, is how the roller coaster interacts with the surrounding areas. I've never seen a coaster that is intertwined so much with other coasters, adding even more excitement to an already exciting coaster. With underground tunnels, near-misses, and at one point even sharing the same track support as Blue Fire, Wodan is a remarkable masterpiece. The best moment is when the track passes over the bottom of the main drop of Atlantica Supersplash. For a roller coaster that is smooth yet rattles, that is typical but has its own non-typical features, Wodan is an embodiment of Europa Park's ambition to create not just merely a coaster, but also an experience. 9/10. Arthur: The Ride is one of those rides that doesn't give you high expectation before riding it, but leaves you in shock and amazement after you get off. Arthur: The Ride is Mack Rides' first powered inverted roller coaster that utilizes spinning vehicles complete with their own on-board audio system. Despite its designation as a roller coaster, I did not feel Arthur: The Ride is a roller coaster. Rather, it is a dark ride that perfectly combines the roller coaster experience into its layout. Additionally, thanks to its powered system throughout the entire track, the ride does not rely on gravity to move the vehicles. Guests are being loaded onto Arthur: The Ride's vehicles before they embark on their 4-minute journey. Admittedly, the show scenes and dark ride portions of Arthur: The Ride is not comparable to those of neighboring Disneyland Paris. There are scenes that I must honestly say are rather ineffective. For example, the use of screen at the beginning of the ride feels cheap: the vehicle simply rotates facing the screen and the media moves accordingly to the pace of the vehicle you're in. Before you even pass through the screen, the next media already plays for the next vehicle, making the transition rather awkward. Yet, for what this ride lacks in theming, it compensates in charm. Perhaps I've been so used to the idea of being completely enclosed in a room to be immersed in the dark ride experience, or perhaps I've been so used to Disney's standards for dark rides. But I found Arthur: The Ride's imperfection charming. No advanced audio-animatronics, no ground-breaking technology, nothing revolutionary. But the storytelling aspect was there, and I can understand the story. For me, that's what Arthur: The Ride achieves very well: they can clearly tell the plot of the ride despite the limitation of the technology. Arthur: The Ride is a mixed indoor and outdoor ride. Here, we see Arthur: The Ride taking the guests flying above the river outside the show building as the vehicles spin around. It also helps that the ride utilizes its space effectively. I found the mixed use of indoor and outdoor space adds a lot to the thrill factor of the ride, despite its designation as a family roller coaster. The final portion of the ride, especially, is exciting: riders fly high by the ceiling as they interact with the wandering guests below inside the building before being launched outside to the top speed of 20 mph while the vehicles spin around. For its flaws and its charm, Arthur: The Ride is a ride that is distinctively European. Having said that, I found Arthur: The Ride as the best ride in Europa Park and, in fact, one of my favorite dark rides I've ever been on (click here for the complete list). 10/10. In the Russia themed area of the park, stands a distinctive set of structures that reflects the sunlight throughout the entire day. An alien-like group of towers made of glasses // mirrors that resembles an outer space station. If you ever see a structure that fits this description, this is without doubt is Euro-mir, Europa Park's first spinning coaster that is truly unlike any other you've ever been on. Euro-mir's vehicles consists of seats facing both forward and backward motion, so it's up to you to choose which way you want to experience the ride. The vehicles will rotate throughout the entire ride in a controlled manner, so you'll never know what your experience be like when you ride. Euro-mir's structures are the most distinctive in Europa Park, consisting of towers made of mirrors. Euro-mir's train is unique, giving the riders choices to experience the first half of the ride forward or backward. The roller coaster journey started with the guests being taken to the top of the main tower with a spiral lift hill, oddly something that I've never experienced before in my life (surprise, surprise!). The lift hill itself is a unique - albeit annoying - experience, with guests given the sight of an odd-looking spaceship that seems to be launching soon. Lights flashing. Techno music that gets stuck to your brain like It's A Small World (seriously). Afterwards, Euro-mir is all about uncontrollable and forceful lateral experience, passing you through very tight turns left and right as it meanders up and down the terrain and the glass towers. It's pretty rough, and if you happen to be facing backwards while they go through the course, expect your bodies to get thrown wildly as you'll never know what's coming. 8/10. Here comes another roller coaster that takes the guests up using spiral lift hill, complete with its own techno soundtrack and flashing lights! The show building that houses this roller coaster is eerily similar to that of EPCOT's Spaceship Earth, albeit in a much smaller scale. Who had the original idea first? Who copies who? I'll leave it up to this debate that you can see here. Located in the France themed area of the park, Eurosat's show building is one of Europa Park's most symbolic structure. The loading station of Eurosat... before they're being escorted into deep abyss of techno music. If there's one roller coaster that I'm not very fond of, it has to be Eurosat. I have no idea how they came up with the idea of this coaster, but I have a feeling that they intended to copy Space Mountain and just did not quite get there. The ride experience itself is in complete darkness and is way too jerky for a space-themed roller coaster. It's actually the only roller coaster where I felt pain. For that, I rode this only once as I had enough. Sorry, Europa Park, but you really screwed this one up. 4/10. Poseidon is one of Europa Park's water coasters found in the Greece themed area of the park. While the roller coaster is decently themed in the loading // unloading station, the entire ride is completely outside, making it a rather disappointing experience if you've ever been to other water coasters, such as Journey to Atlantis at SeaWorld Orlando, which has more elaborate theming and storytelling. There are 2 splashdowns in Poseidon: 1 immediately after the bigger lift hill and the other 1 after the guests go through a smaller lift hill and a curved drop. Thanks to the water jet effect at the bottom of each splashdown, Poseidon is a delight to watch by people who don't ride. Who wants to get wet? It's such a delight to see riders plunging into the splashdowns on Poseidon. The ride experience itself, however, leaves much to be desired. Perhaps it's because Poseidon is Mack Rides' first model of this kind of water coaster, but - oh Lord - this roller coaster is very painful. It jerks me around left to right uncontrollably like Mean Streak. I don't think I've ever been thankful for a ride that doesn't get faster than a certain speed. 5/10. Atlantica Supersplash is the second water coaster at the park. Unlike Poseidon, however, Atlantica Supersplash utilizes a much bigger vehicle - 20 people/boat instead of 8 - and a bigger drop (~100 feet). Supposedly, this ride is all about the "supersplash," hence its popularity in the summer season. Atlantica Supersplash drops the guests into a splashdown. Behind, Wodan soars above. Atlantica Supersplash smartly teases the riders on what's to come at the top of the first hill. A turntable turns the boat 90 degrees to the left, and then sent the boat hurtling backward through a small dip onto a second hill, which then turns the boat 90 degrees to the left once again and sends the boat go down the main drop into the splashdown zone. The ride is notably shorter than Poseidon, yet much more fun. The small hill at the bottom provides good amount of airtime, which is always a nice addition to the big splash that rewards the riders at the very end. Definitely a must if you want to get wet. 8/10. Alpenexpress Enzian, a mine-themed powered coaster that sends the riders through two full circuits of the track. The coaster reserve the first five rows of the train exclusively to those who want to wear Virtual Reality (VR) devices to experience the roller coaster (extra charge of €2/person). Not bad, but not a must-ride either. 6/10. Riders have the option of experiencing Alpenexpress Enzian using VR devices for an additional charge of €2/person. Matterhorn Blitz, a Swiss-themed wild mouse style coaster with an elevator lift instead of a traditional chain lift hill. Following the lift, the model resembles that of other Wild Mouse coaster, albeit with two large drops at the beginning. 7/10. Pegasus, a junior roller coaster with bigger-than-average drops for its kind. With a top speed of 40 mph, Pegasus is a middling roller coaster, not really for kids, not for adults either. Ride is too short and the line is usually long. VR devices are offered to those who are willing to pay an extra charge of €2/person. 5/10. Schweizer Bobbahn, a bobsleds-style roller coaster with enjoyable layout, but nothing unique. 6/10. Feels like you can fly on Schweizer Bobbahn. Europa Park is a theme park that is distinctively - without doubt - German: high efficiency, well-behaved guests, astounding landscaping, and great maintenance. Hell, if I want to say that the guests themselves are efficient, I wouldn't hesitate saying so. Additionally, Europa Park's food offerings are amazing - much better than those of Disneyland Paris (sorry, Disney, you lose this time...). Thinking about it, it's no wonder that Disneyland Paris continues to having a difficult time attracting German visitors. When you have theme parks that offer more for much cheaper prices, then what's the argument here? The food offerings at Europa Park is the best I've ever experienced in Europe, with each themed area having different culinary experience. Theme park operators around the world should Europa Park as an efficiency model to follow - particularly those who focus on thrill rides and roller coasters like Six Flags and Cedar Fair. 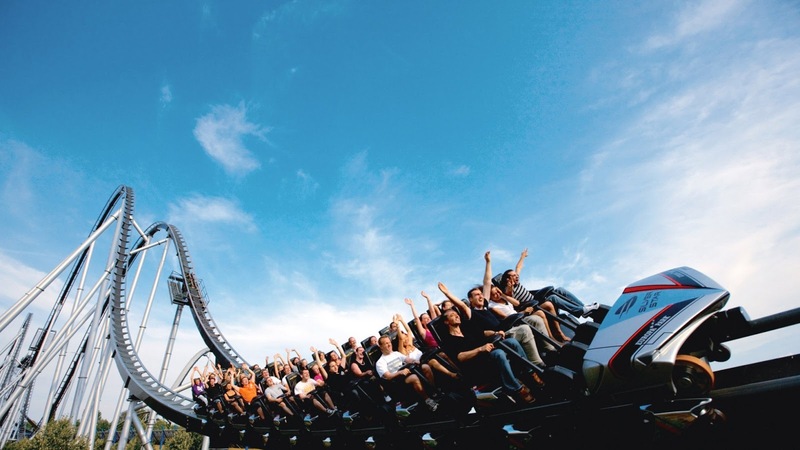 Though it's true that safety remains top priority when operating theme parks, Europa Park takes that up a notch by proving that you don't have to sacrifice efficiency to maintain safety throughout the park. If you're a theme park fan who has never visited a true European theme park before, then Europa Park is a must-visit for you. It helps that the theme park is very accessible from the neighbouring cities of Basel, Freiburg, and Strasbourg. Try to visit on a great day, though, as there is not a lot of canopies to protect you from the rain (in case the weather gets bad).